Jorien “Sheever” van der Heijden is lively when we sit down to chat. A five-time veteran of The International, this event isn’t quite the same as the previous ones. In May, she was diagnosed with breast cancer. Sitting on the concourse floor in Key Arena in August, several weeks into the Dota 2 tournament that annually consumes Seattle, you might think it was her first day there. Van der Heijden’s career in Dota 2 stretches back to 2012. 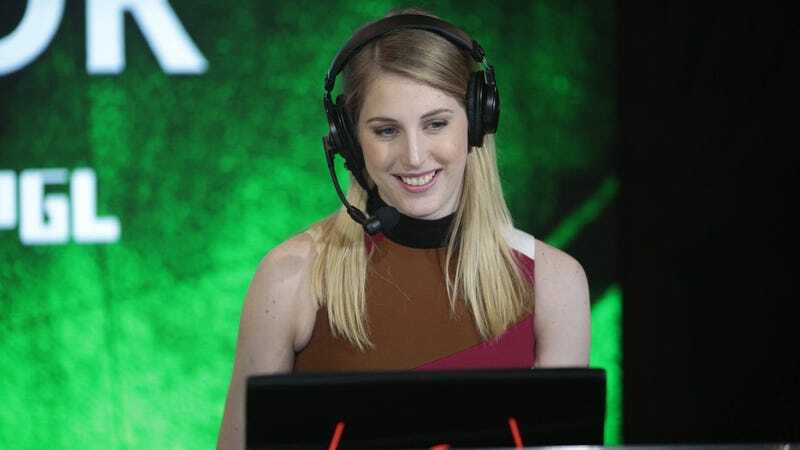 She was laid off from a job selling PC parts, but van der Heijden had been an admin for Dota 2 tournaments and even dabbled with commentating an amateur tournament, so with some money saved up, she decided to take a stab at making Dota a full-time job. Over the course of the last five years, van der Heijden has become one of the faces of Dream League and a prominent member of the Dota 2 community. She’s commentated matches at The International, hosted panel and analyst segments, and streams regularly to a solid audience of Dota faithful. Much of that security was upended, however, with the news of her diagnosis. Van der Heijden says she’s had to overcome a lot of adversity in her career, not just as a woman in a predominantly male scene, but as a commentator in general. A clip of a missed Ravage as Tidehunter became synonymous with her screenname, and in a crowded Dota 2 landscape, it can be hard to carve out a niche for yourself. But, persevering and turning the joke back around on others, van der Heijden has built a name for herself in Dota 2. Cancer was just another hurdle to climb. Acceptance, van der Heijden says, came faster than she thought it would. Grasping the realities and moving on to what came next came soon after the first round of chemotherapy. At some point, it became clear that the stars had aligned: The biggest tournament in Dota 2 happened to fall right between chemo appointments. As the realization of this opportunity set in, so did a new set of questions. Could she attend? Would she be invited? Would she be well enough to work? There was worry and doubt, compounded by the distress of how this might affect her future job prospects. The “germfest” of The International, the long days, endless broadcasts and hype can be draining. But when van der Heijden set foot on U.S. soil, everything changed. Normally, she says, a trip to the states from her hometown in the Netherlands leaves her jet-lagged and tired. This year, though, she was happy to be in town and heading off to commentate some of this year’s group stage matches. Originally, van der Heijden tells me, she had not planned on telling anyone about her breast cancer diagnosis. It’s a personal matter—“something that’s very close to heart, literally and figuratively”—and she was concerned about the community’s reaction. Her sister eventually convinced her to open up, to let the fans who had seen her cast at multimillion-dollar events also be there when she’s going through hard times. Initially, the reaction was incredulous: An email sent out to van der Heijden’s subscribers was thought to be fake, and the mods of the Dota 2 subreddit weren’t quite sure what to make of it. After a walk around to clear her mind, van der Heijden went live on Twitch and explained the whole situation. Since then, the reaction has been incredibly supportive. Others within the Dota 2 community and in the general games industry reached out with advice and well wishes. The Dota 2 subreddit allowed users to add a pink border to their flair, in support of Sheever. At several points before, during, and after our chat, fans would stop by to say hi, snap a selfie, and wish her the best of luck. In many ways, van der Heijden is an inspiration to the community just as much as its embrace has been an inspiration to her. In her day-to-day work, van der Heijden has stayed in contact with tournament organizers, several of whom have assured her that she will have a job to return to. Though she’s been on a break from hosting and commentary outside of The International, she still streams Dota 2 on Twitch, playing games and interacting with her fans. At The International 7, van der Heijden only worked the group stage matches, so her main event time was largely open and free of analyst panel stress. She tells me her favorite moment was getting to sit in a suite as just a spectator, for once, for the Virtus.pro vs. Team Liquid series, cheering along with the crowd. Dota 2, as van der Heijden describes it, is a constant struggle to improve yourself, a game about learning and growing through every match; An interesting analogue to her own experiences as commentator, host, and analyst. Her first day back home after The International, the routine will start again. Van der Heijden will head to the hospital and have her blood checked, followed by reviewing an MRI result. Then she will get the green light to start chemo again, and it will be back to treatment. But sitting on that concourse, seeing the outpouring of support from fans, it’s clear that van der Heijden isn’t in this fight alone. Matthew Bailey, director of operations for Team Secret, started a rumor on Twitter leading up to The International 7. Several treasure chests—random loot boxes—were released with unique items inside, and each one could be purchased with the signature of a commentator or analyst who would attend TI7, giving them a small portion of the profits. Bailey tweeted that van der Heijden’s treasures seemed to have a greater chance of eliciting a rare result. While in jest, others directed fans to seek van der Heijden’s signature over their own. She laughingly confirmed to me that there are no greater odds on her treasure over others, but it’s one of many gestures that show van der Heijden isn’t in this fight alone.